Have you ever wondered why works of art considered famous and unproblematic by modern viewers were interpreted as scandalous by their contemporaries? The short answer is: it’s all about context. During the nineteenth century, the expectations of art audiences in Paris were conditioned by norms established in the eighteenth century, a situation which led to controversy and confusion. In her talk, Professor Facos will share some of the more famous and funny examples, offering insight into this dynamic and contested era in French art. Michelle Facos teaches art history at Indiana University, Bloomington. She received her PhD from the Institute of Fine Arts, New York University, with a dissertation on Swedish painting and national identity at the end of the nineteenth century. She has published and lectured widely on the subject of Scandinavian art and culture and has taught in China, Germany, Poland, and Sweden. Her most recent books, Symbolist Art in Context and An Introduction to Nineteenth-Century Art (along with its website www.19thcenturyart-facos.com), are read in classrooms around the globe. 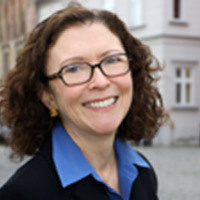 Dr. Facos is currently writing books about the Copenhagen Art Academy circa 1800 and about the Jewish contribution to Swedish national identity circa 1900.